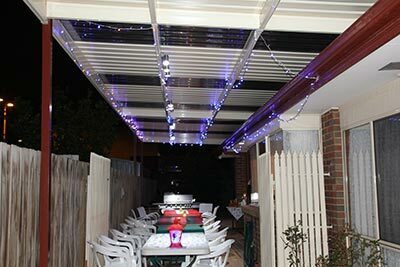 When the owners of a house in the Melbourne suburb of Altona approached branch owner Jaan McKenzie, from Outside Concepts Western Branch, they wanted an outside structure that would double as a carport and entertainment area, but that wasn’t their only request. They also needed a structure that was higher than the roof of their house, to allow extra clearance for their campervan. To provide the extra clearance required, Jaan used Bluescope Colorbond Firmlok for the frame and connections. This allowed a span of 9m between posts to be achieved, providing improved access as the sides of the structure. In addition, a flyover roof was installed, using Extenda brackets, to lift the height of the structure above the roofline of the house. Clearance wasn’t the only consideration. For the roofing, a combination of Colorbond and Polycarbonate was used, to maximise light under the carport and inside the house. To ensure the carport perfectly matched the house – and made it part of the home rather than an addition – the colours used for the project were also carefully chosen. So happy are the clients with the finished product that they’ve already put it to great use, recently holding a party and installing designer lights for the occasion!